Write Choices: Elements of Nonfiction Storytelling helps writers cultivate their nonfiction storytelling skills by exploring the universal decisions writers confront when crafting any kind of factual narrative. 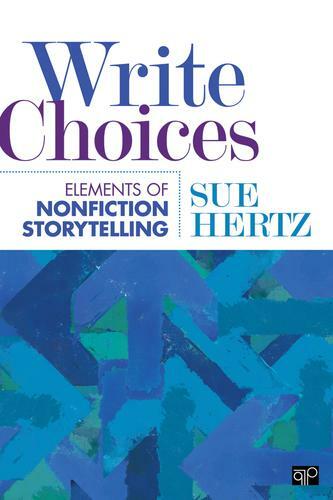 Rather than isolating various forms of narrative nonfiction into categories or genres, Sue Hertz focuses on examining the common choices all true storytellers encounter, whether they are writing memoir, literary journalism, personal essays, or travel essays. And since today’s writers are no longer confined to paper, Write Choices also includes digital storytelling options, and how writers can employ technology to enhance their narratives. Integrating not only her own insights and experience as a journalist, nonfiction book author, and writing instructor, but also those of other established nonfiction storytellers, both print and digital, Hertz aims to guide writers through key decisions to tell the best story possible. Blending how-to instruction with illuminating examples and commentaries drawn from original interviews with master storytellers, Write Choices is a valuable resource for all nonfiction writers, from essayists to memoirists to literary journalists, at any stage of their career.